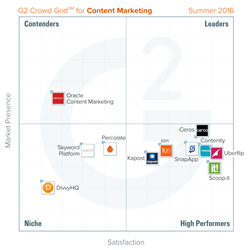 G2 Crowd, the world’s leading business software review platform, today released the Summer 2016 Content Marketing Software Grid report to help businesses make the best content marketing technology decision. Ceros, Contently, SnapApp, Uberflip, ion, Kapost and Scoop.it were named High Performers in the report, earning strong customer satisfaction marks with smaller market presence scores. Uberflip earned the highest overall satisfaction score, while Oracle Content Marketing earned the highest overall market presence score. The Grid leverages customer satisfaction data reported by authenticated users along with vendor market presence determined from social and public data. Based on a combination of these scores, each software solution is categorized as a Leader, High Performer, Contender or Niche. Value in variety – Reviewers appreciated content marketing tools that facilitate the creation of a wide variety of content formats to better capture the attention of readers. Users were willing to sacrifice ease of use for a plethora of content types and the ability to track reader engagement with content. Collaborative content – Content marketing products with well-liked collaboration tools received higher satisfaction ratings overall. Users appreciated products that allow multiple users to work on a content piece at one time. Minor market presence doesn’t matter – All but one product in the Content Marketing category have a market presence score of 45 or below. The product with the largest Market Presence score received one of the lowest Satisfaction ratings in the category (normalized for the Content Marketing category). The report is based on more than 220 reviews written by business professionals. Of the 119 products listed in G2 Crowd’s Content Marketing category, the ranked products each received ten or more reviews to qualify for inclusion on the Grid. G2 Crowd, the world’s leading business software review platform, leverages more than 80,000 user reviews to drive better purchasing decisions. Technology buyers, investors, and analysts use the site to compare and select the best software based on peer reviews and synthesized social data. Monthly more than a half-million people visit G2 Crowd’s site. Co-founded by the founder and former executives from SaaS leader BigMachines and backed by roughly $12 million in capital, G2 Crowd aims to bring authenticity and transparency to business technology research. For more information, go to G2Crowd.com.